With 40,000 fans onsite watching five live eSports stages and four content stages it simply doesn’t get any bigger for the Blizzard Entertainment production operation than BlizzCon. In addition, Blizzard’s Global Broadcast team distributed a whopping 211 unique broadcast streams to 17 outlets in 18 languages from the event at the Anaheim convention center last weekend. “For us, the live event and the broadcasts are very linked together because so much of the broadcast is from these live stages. 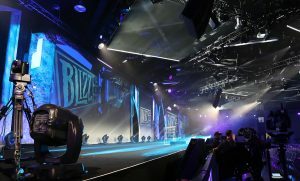 Our show is definitely bigger this year,” said Pete Emminger, senior director, Blizzard Entertainment.